You will be given a reference e-book to read which has 800 pages And the test will be based on that e-book , you can take final test within 1 year of purchase. Social media marketing for business can be defined as a process of generating attention or website traffic with the help of popular social media sites. Most of the programs used in social media marketing are more focused on carrying out activities that involve creating contents designed to grab attention while also encouraging the readers of the said contents to share what they have learned to their social networks. The entire process actually involves spreading a corporate message from one social networking site user to another because the message seems to be coming from a reputable, trusted and fair third-party source. Social media marketing can also be expected to offer success through word of mouth. This means that the results of most social marketing campaigns are usually earned media instead of paid media. What makes social media marketing useful is the fact that it is more effective in connecting and interacting to your audience in a more dynamic and personalized manner. While there are social media strategies that can be successfully carried out by following simple steps like setting up a Twitter account or company blog, there are also complex ones and these involve full online marketing campaigns through social networking and posting viral videos on YouTube. If you want to be able to effectively handle all your social media marketing campaigns, then it is best if you take up a social media marketing course so you will know everything about this field. A reliable social media marketing for business certification course can be completed through a reputable online certification and employment testing company called Brainmeasures. Brainmeasures has been around for a long time already and from the moment it was established, it never fails to satisfy the needs and requirements of those who planned to take up certification course to further hone their skills in their chosen fields of concentration. The social media marketing for business certification course offered by Brainmeasures aims to provide you with useful information about social media marketing and the many strategies that you can use including the tagging of blog entries and articles for easier voting and submissions through social news websites such as Digg, setting up blog and social networking accounts for your business and posting videos on YouTube that have greater chances of becoming viral. 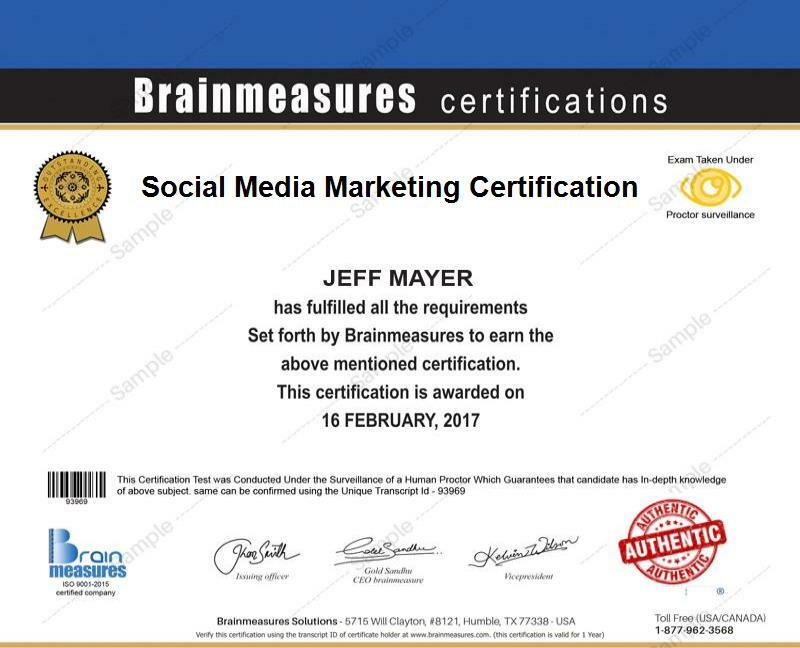 Another advantage of this certification course from Brainmeasures is that it has an online social media exam which is primarily designed to evaluate your social media marketing knowledge and skills. Before Brainmeasures will provide you with your online certification, you need to pass the social media marketing test. The social media marketing for business certification program offered by Brainmeasures is perfect for anyone who wishes to start doing online marketing campaigns with the help of social media marketing sites. You can expect this certification course to be even more suitable for professionals working in the PR, marketing, operations and sales departments of an organization who wish to generate skills, confidence and knowledge in terms of effectively implementing mobile, internet and social media marketing campaigns with an aim of allowing the organization which they are a part of to achieve growth. Aside from letting you enjoy a wide range of career opportunities, you can also expect the act of finishing up a social media marketing certification course to help you in increasing the amount of salary that you regularly receive. As a social media marketing expert, you can expect your annual salary to be around $62,000 to $117,000. You can expect this amount to grow all the more if you work in a well-renowned business organization and you gain more years of experience in the field.